The Electric Telegraph Company of Ireland was initially promoted in December 1851 as the “Irish Channel Submarine Telegraph Company” and provisionally registered in January 1852 from temporary offices at 15 Great Bell Alley, Moorgate Street, London. It talked in the press of a capital of £500,000 for lines from Dumfries in Scotland, where a connection was to be made with the mainland circuits, to an underwater cable between Scotland and Ulster, and by a line “thence to Belfast, Dublin and other places in Ireland”. There was an elaborate provisional structure with three noble Patrons, the Rt Hon Viscount Barrington; Rt Hon Lord Dufferin and Claneboye; and William Ormsby-Gore, MP; three Trustees, Marquis of Londonderry, GCB, Holdernesse House, Park Lane, London; John Laurie, 1 Hyde Park Place, London; and J Lewis Ricardo, MP, 31 Lowndes Square, London; and nine Directors on the Board, Hon Edward Cecil Curzon, Scarsdale House, Kensington; Rear-Admiral Sir W H Dillon, KCH, Burton Crescent, London; James Sheridan, Sheridan & Son, Dublin; I H Bristow, Stanhope Place, Hyde Park, London; Joshua Mayhew, Fitzroy Square, and Enfield Place, Middlesex; Rear-Admiral Sir R O’Connor, KCH, Stanhope Terrace, Hyde Park, London; Hon George Massey, Albion Street, Hyde Park; George Griffin, of Griffin Brothers, Beal’s Wharf, Southwark; and Colonel Cooper, Charles Street, St James’s, London; all except two being naval and military retirees and local gentry. It was clear from the beginning that, despite its aristocratic components, the projecting power was George Griffin, a wharfinger, trading as Charles & George Griffin & Company, of Beal’s Wharf, Southwark, London. The Superintendant Engineer and Secretary was S F Griffin, his son. No one connected with the existing electrical establishment was involved. 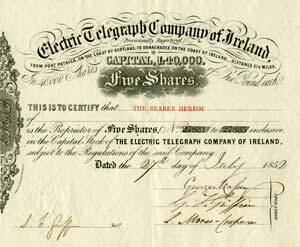 Stock Certificate of the Electric Telegraph Company of Ireland, dated 27 July 1852. The proposed route was Portpatrick, Scotland - Donaghadee, Ireland. The prospectus of the “Irish Channel Submarine Telegraph Company” eventually issued on April 6, 1852 was optimistic in extreme, even though it had reduced its anticipated capital needs to just £40,000: it anticipated using circuits line side of the railways between London and Carlisle and from Dublin to Belfast, laying two lines each of four wires, offering two wires solely for the use of the government. Only the land sector between Dumfries for Carlisle and the Scottish coast was required to be constructed in addition to the cable. It anticipated also that a Royal Charter would be granted before the laying of the cable from Port Patrick to Donaghadee and the land line to Dumfries, all due to be completed on May 20, 1852. It was to use the system adopted on the French submarine cable, devised by Samuel Statham of the Gutta-Percha Company. A clause in the Company’s original deed of settlement bound it to co-operate with the Electric Telegraph Company. Very few in this series of promises were to come to fruition. Despite its modest capital the company found that it would have to construct its own land line from the cable end at Donaghadee to Dublin, as well as those from Dumfries to Port Patrick. It compromised in this by laying only single two-core land circuits, and by sourcing a cheap competitor to the Gutta Percha Company. The manufacture of the underwater cable was delayed for several months. Despite the Ireland’s claims, the Electric Telegraph Company in London was committed to supporting a competitive cable between Holyhead in North Wales and Dublin which required no additional land lines. In any case, the company adopted its own electric telegraph incompatible with that of any other company. By May 1852, the Ireland company had indeed started entrenching a two-core gutta-percha insulated but otherwise unprotected underground land line along the road from Dumfries to Port Patrick, intending to have it complete by June 31, but delays occurred as torrential rain damaged the narrow trenches. 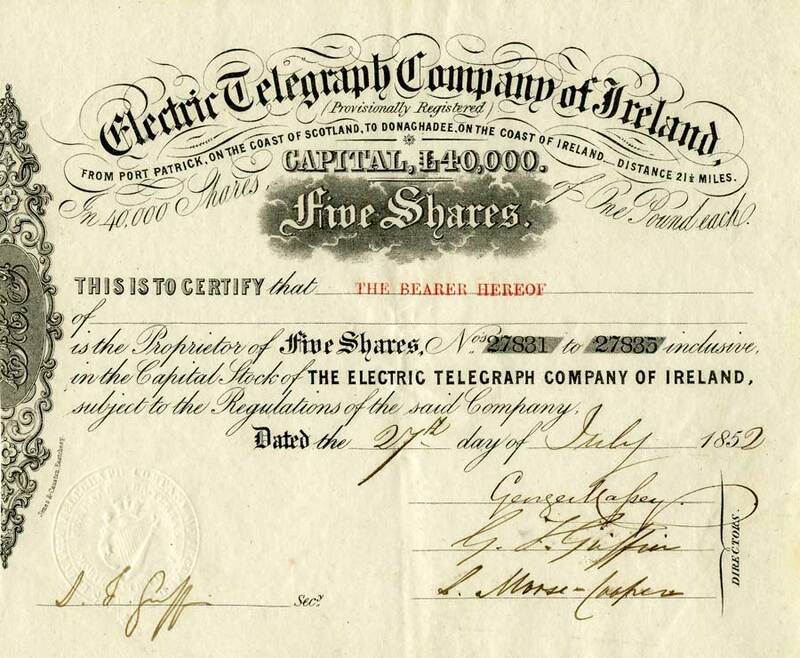 On July 12, 1852 the old title was abandoned, a deed of settlement signed by its subscribers and the scrip for 40,000 shares issued in its newly adopted name of the Electric Telegraph Company of Ireland. The much reduced board was chaired by Rear Admiral Sir William Henry Dillon, RN, KCH, of Arundel Street, London, and Hanwell, Middlesex, with a board that included the Hon George Massey of Limerick and Walthamstow in London, Lt Col Leonard Morse Cooper of Wargrave, Berkshire, George Featherstone Griffin CE of Tillington, Staffordshire, and John Newman Tweedy of Montagu Square, London, who might be best described as speculators. The Secretary was Sandiforth Featherstone Griffin, the son of one of the directors. On July 18, 1852 the Reliance under Captain Edward Hawes RN, the Admiralty’s general superintendent at Port Patrick harbour, set out from the English coast with George Massey, the Company’s managing director, S F Griffin, now styled engineer, W L Gilpin, the contractor, G Dering, the electrician, and J Fletcher, the company’s superintendent of works, on board. In addition the vessel carried, as observers, Dr Joseph Christoph Hamel of the St Petersburg Academy of Science, John Baker of London; Samuel Glyde, London, Mr Forster, London, Lackington Bunn, of the Gutta-Percha Company of Lambeth, the cable manufacturers; and Captain Stoddard of the Donaghadee Coast Guard, acting as pilot. The Reliance, accompanied by a steam tug from Belfast, carried twenty-five miles of underwater cable; it successfully laid and electrically-tested seven miles of wire out from Port Patrick. Captain Hawes then decided that strong sea currents were setting in and continuing cable-laying could only proceed after the spring tides were over. The line was marked by buoys. On the Saturday morning of July 24, the Reliance returned to grapple the cable-end, which the crew did with immense difficulty. The ends were joined and the vessel continued towards Donaghadee at three miles per hour, succeeding in laying a further fifteen miles. It reached Ireland at ten o’clock at night in heavy gales. The cable was tested, found electrically sound and, then as it was not possible to land it, buoyed-off in the sea. The principal length of the Ireland company’s first underwater cable was described as being of two copper wire cores insulated with gutta-percha protected by a covering of hemp rope. The cores were manufactured by Christopher Nickels & Company, of Lambeth, who had also made the Company’s land-lines. For the shore-ends at Port Patrick and Donaghadee, which were subject to wave action and abrasion, W Küper & Company, wire-rope makers, of Camberwell, London, were to make two short armoured cables but money for these apparently ran out. A short-lived, temporary shore connection was made and worked, but eventually the long hemp cable had to be sealed and buoyed-off in the sea at both ends. The Ireland company’s contractor for its armoured cables, Küper & Company, was soon to become Glass, Elliot & Co., who themselves eventually became the Telegraph Construction & Maintenance Co., creators of the successful Atlantic cable of 1866. The Magnetic Telegraph Company was also active with cable works over the same short stretch of water to Ireland during May and June. There was a hiatus in the Company’s initial rush of activity during the following months. It was not until August 1852 that William Lawrence Gilpin of Bayswater, London, a civil engineer and partner in a wire mill at Aston, near Birmingham, agreed with the Board to complete its entire works in Scotland and Ireland for £27,000. On December 27, 1852 the Board of Directors reported that the 69 miles of two-core underground cable in Scotland were completed and they were working the 42 miles from Dumfries to Newton Stewart; clerks were training for the rest of the lines there. It also reported, according to Captain Hawes of the Royal Navy, that the isolated six-month-old underwater cable was still in good condition. With 16,000 out of 40,000 shares already applied for, it had decided to apply to Parliament for a Special Act to authorise its works, rather than obtain a Royal Charter as originally planned. The Electric Telegraph Company of Ireland obtained a Special Act of Parliament to authorise its formation, its cable and its circuits in Scotland and Ireland on August 4, 1853, with a modest capital of £40,000 in shares of £1 and £8,000 in debenture debt that could be incurred once all of its share capital was called-up. However only 27,000 of its 40,000 £1 shares were taken up, and not all of the shareholders could be got to pay their calls into its account with the Royal British Bank in London. It was not associated with its English namesake, the original Electric Telegraph Company of 1845, and, as it was limited by its Act to circuits in Ireland and Scotland, it apparently intended to connect onward from Dumfries by transcribing messages to the circuits of the British Telegraph Company, which then operated in the major cities in Scotland and the north of England. Although reported sound the first underwater cable, without its armoured shore-ends, was not to be put in circuit and was abandoned. The Ireland company used George Edward Dering’s single-needle telegraph, patented in 1851, in all of its circuits and was to adopt his curious theories regarding insulation in 1853 for a replacement cable between Ireland and Scotland. Dering described his theory on underwater cables in his patent of 1853 as follows “I have discovered that a metallic circuit formed of wires, either wholly un-insulated or partially so, may be employed for an electric telegraph, provided that the two parts of the circuit are at such a distance apart that the electric current will not all pass direct from one wire to the other by the water or earth, but that a portion will follow the wire to the distant end.” He apparently successfully demonstrated this discovery across the river Mimram on his estate in Hertfordshire, England, for the Company’s board of directors. In 1853 G E Dering was 22 years of age. Donaghadee to Port of Spittal Bay south of Port Patrick by the Albert, escorted by HMS Asp, the survey vessel stationed at Pembroke. A half-mile shore-end wire was laid, then on November 22, in foul weather, the 28 miles of main wire was joined and a further 3½ miles laid before it broke. On November 26 another attempt was made by the Albert, this time 12 miles were laid before the wire broke again in 82 fathoms of water. After several attempts to grapple the underwater wire by the Albert it was abandoned. The Ireland company made a brave face at the Irish Industrial Exhibition in Dublin between May and October 1853, working traffic from the halls to its office on Eden Quay and north towards Belfast with 120 miles of roadside subterranean line. Its much larger competitor, the English & Irish Magnetic Telegraph Company, which already had a submarine line to Britain, completed in May 1853, did not even have a stand. During 1853 the Ireland company was also supplying news to papers in Dublin and Belfast. After laying 192 miles of underground line with 400 miles of wire in Scotland and Ireland, but being without the intermediate cable, the Ireland company was in severely difficult financial circumstances, having raised and expended £26,255 in share capital and, despite not having Parliamentary authority to do so, having raised £16,560 in loans; whilst still owing money to its contractor, W L Gilpin, to Nickels’ Gutta Percha Company of Lambeth for its land-lines, and having judgements for others debts made against it. Gilpin agreed to forgo all of his claims against the Company and surrender the works and materials still in his possession in July 1854 in return for a final payment of £600 and the writing-off of a debt of his of £2,000 to the Royal British Bank used to buy materials. The Ireland company’s new secretary, James Troup, and three directors had to find the money among themselves to settle his claim. The Company closed its offices on July 31, 1854 after working at a continuous loss. The shareholders finally resolved to wind-up the Company on May 7, 1856 and its assets and rights were sold-off for their benefit. This was followed by a mass of litigation in an attempt to recover money to repay the illegal debts. As a final nail in the Ireland company’s coffin, its bankers, the Royal British Bank, collapsed in criminal disgrace in September 1856. Richard Hartley Kennedy, formerly a director of the competitive English & Irish Magnetic Telegraph Company and a neighbour of the contractor, Gilpin, in Bayswater, was Deputy Governor of the bank. The British Telegraph Company, having lost its anticipated connection when the Ireland company’s cable failed in November 1853, promoted its own underwater cable from Scotland to Ireland which was successfully completed on June 2, 1854. To connect with its domestic network the British Telegraph Company laid an underground circuit from Whitehead to Carrickfergus for Belfast, and another to Stranraer and Ayr for Glasgow in 1855. The connection to Dumfries for London was not completed until March 1855. It used Highton's single needle telegraph in its circuits. To read Steve Roberts’ story of the Electric Telegraph Company of Ireland in context with other British telegraph companies of the time, see his Distant Writing website.